Full of excitement throughout this trip from villages, green hills, forest, landscapes and mountains are the main attraction and highlights of this trip, beneath world’s 10th highest Mt. Annapurna at 8,091 m and 7th highest Mt. Dhaulagiri 8,167 m, , trekking around Annapurna and Dhaulagiri massive mountain range, dramatic variation from sub-tropic – mediterranean, alpine to arctic climate temperature and landscapes, daily amazing panorama views with views of world’s 3highest mountains Annapurna-Dhaulagiri & Manaslu, fascinating traditional mid hills Gurung, Manang, Thakali & Pun Magar tribe villages, super mountain panorama with breathtaking sunrise from Pun Hill and trekking in world’s deepest gorge of Kali-Gandaki River. Trexmount Ventures welcomes you in our remarkable and fascinating trekking to Annapurna High Pass to experience an adventure of a life time, listed as world’s 10th top scenic travel destinations by Lonely Planet with outstanding views and walking through friendly traditional hill villages in the land of legendry Gurung, Manang, Thakali and Pun, Magar tribe’s renowned as Gorkha soldiers in various countries. Mt. Dhaulagiri 8,167 meters with adjoining Nilgiris, Tukuche peaks and Vara Shikar / Annapurna Fang with Mt. 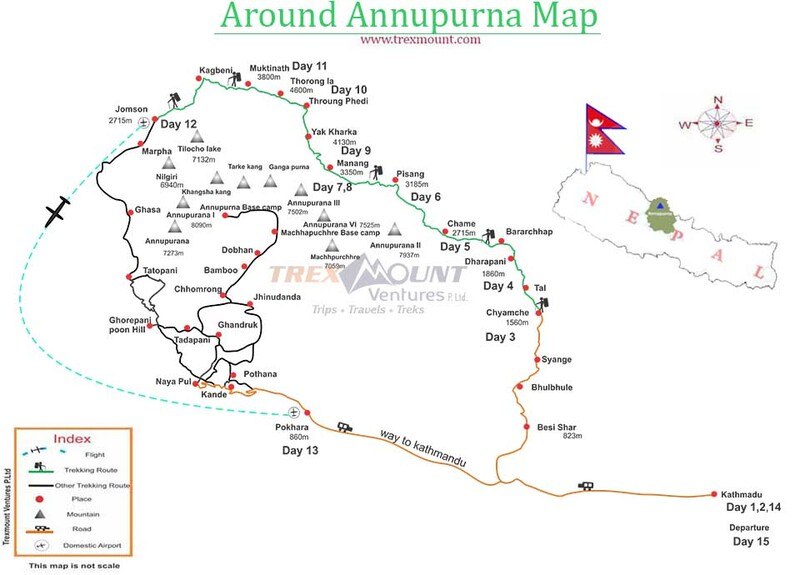 Machhapuchhre ‘Fish-Tail’ 6,997 m-22,956 ft.
Annapurna High Pass Trek starts from Lamjung and Manang area and concludes at picturesque Pokhara valley one of the main touristic spot in all Himalaya, where the mountains reflects on its tranquil Phewa and Begnas lakes, walk leads to high mid green mid hills villages inhabited by Gurung and Magar tribes, and as the walk progress heading closer to mountainous and in the alpine zone with pretty scenic villages of Dharapani and Chame. After the alpine area leaving behind the tree lines and forested area to dry arctic terrain at Manang valley a complete Buddhist region of strong Tibetan influence in culture, tradition, religions and in daily life, at Manang with rest day to acclimatize before heading higher to Thorang-la pass. Annapurna High Pass Trek offers awesome scenery nearly every day with glorious views of snow capped peaks and valleys as the walk follows River Marsyangdi right up to its source near Manang lake fed from the glacier of Tilicho, A II and Gangapurna Himal. After being well acclimatized heading higher in barren arctic terrain to reach the highest point of this trek at Thorang-la 5,416 m / 17,700 ft with awesome picturesque panorama that surrounds this scenic windy spot, walk descends to holy Muktinath area, regarded as holy since ancient times with 108 spout flowing pure natural spring. Muktinath meaning Liberation, pilgrims visits to offer prayer and to liberate from the sin of a life time, walk leads on the dry windy valley of Kaligandaki river to Jomsom, the headquarter town of Mustang area with a small airstrip, where the people are from the Thakali tribes, a traders for many years on this Trans Himalayan Salt Trade Route, at present running hotels and lodges with appealing food menu. Walk passes several interesting villages of Marpha, Tukuche, Larjung and Kalapani famous for apples and its products and back into green forested area with awesome views of both Dhaulagiri and Annapurna range of mountains on either side of this Kaligandaki valley forming as the world’s deepest gorge. Journey continues back in warm paddy fields area at Tatopani ‘hot spring’ and then on the trail to Pokhara with an uphill through enchanting rhododendron forested to Ghorepani, visiting Pun Hill for super Himalayan panorama with stunning sunrise and on the long downhill path to conclude this amazing trek at Nayapul with a drive to scenic Pokhara valley and then back in the hustle bustle city life of Kathmandu after a wonderful and remarkable trek completing full Annapurna High Pass with great service of Trexmount Ventures with its friendly staff and guides. Day 03: Drive to Chamje (1,560 m-5,118 ft) via Beshishar (823 m -2,700 ft) 08 hrs journeys. Day 04: Trek to Dharapani (1,920 m -6,299 ft) 05 hours. Day 05: Trek to Chame (2,670 m -8,759 ft) 05 hours. Day 06: Trek to Pisang (3, 230 m -10,597 ft) 05 hrs. Day 07: Trek to Manang Village (3,450 m -11,319 ft) 05 hrs. Day 09: Trek to Yak Kharka (4,110 m -13,484 ft) 04 hours. Day 10: Trek to Thorong High Camp (4,600 m -15,092 ft) 04 hrs. Day 11: Cross Thorong-La (5,416 m-17,770 ft) and to Muktinath (3,800 m-12,467 ft) - 07 hrs. Day 12: Trek to Jomsom (2, 670m-8,760 ft) via Jomsom (2, 715 m-8,907 ft) - 06 hours. As time set by our guide who accompanies you throughout this trip, depart from the hotel for an interesting drive on the busy road towards Chamje via Beshishar, drive leads through Himalayan foothills and green valley’s till Dumre town, and leaving the main Kathmandu / Pokhara highway towards Beshisar a large town and headquarter of Lamjung district, from here driving on the newly built dirt road leading to Chamje via Khudi, Bhulbhule and Ngadi following the Marsyangdi River upstream, the drive continues passing rice terraces and villages and then uphill on leaving the Marsyangdi River to reach at Chamje for overnight stop via Jagat village, Chamje a small farm village with many lodges and the people from here are Manang of Tibetan origin. From here onwards feel the cool and fresh mountain air,our morning walk leads through enchanting alpine forests of rhododendron and pine tree lines following the Marshyangdi River upstream with several ups and downs to Bhratang village, after this small village walk follows uphill’s through the woodlands at Dhukure Pokhari with couple of teahouses overlooking views of Chulu’s and Pisang peak and of Pisang village, after a break here descending to reach the lower Pisang village for overnight stop, afternoon at leisure and rest as the high altitude starts from here onwards. Morning with wonderful views of snow capped peaks with close look of A II North Face, heading towards a hill through nice pine woodland where one can catch awesome views of Manang valley with surrounding high snow capped mountains, from this view point heading downhill towards Manang valley reaching Hongde village with a small airstrip, (flight to and from Pokhara is only twice a week and unpredictable), from here onwards tree lines disappears into arid and barren landscapes with cold, dry climate temperature, however gets enough sunshine during the day with strong UV in this thin air altitude. From here with constant views of snow capped peaks reaching at Braga close to Manang village, here it will be interesting to visit the old Braga monastery treasures old Buddhist artifacts, relics and stature with ancient amazing wall Thanka painting ( Buddhist religious painting) and frescos, from here breathtaking views of Annapurna range with Chulus and as far to Manaslu towards east, after a nice time here a slow and steady walk brings you at Manang village for lunch and overnight stop with alluring views of Gangapurna, A II and Tilicho peak and turquoise Manang lake nearby. A complete free and rest at Manang an ideal place for acclimatization which is essential at this altitude above 3,000 meters and to head more higher towards Thorang –la pass, Manang offers various optional short hike to Gangapurna glacier and Manang lake. (Ice Lake takes more than 5 hours both ways we do not recommend unless people are very eager or fit to trek on this rest day). After a nice break and stop for two nights at Manang, morning walks is easier on the gradual path passing the last village of Manang at Tenke and then in complete wilderness with gentle uphill walk to Ghunsang village with great views of Gangapurna, Tilicho and Chulu West peaks, then slowly reaching at Yak Kharka for lunch and overnight stop with great views. Slowly and steady journey gets closer to the main highlights and highest elevation of this trip at Thorang-la pass, walk is pleasant except for the altitude the trail follows crossing a bridge after Ledar and then a short steep climb after the river reaching at Jarjung around this place chances of seeing some wildlife like Musk Deer, Himalayan Thar, Mountain Goats or the rare and elusive Snow Leopard if lucky. Walk then reaches at Thorang Phedi (base of Thorang-la), after a break here walk on the scree zig zag slope path which is quite steep for an hour till High Camp is reached for lunch and overnight stop. A great place with super views of Gangapurna, Damodar and Bhirkuti Himal and range of snow capped peaks. Big Day! Starting quite early after breakfast to reach the top of the pass earlier before the cold wind catches with chill factors, the walk is gradual with ups and even trail most of the way and then slowly with a climb reaching the highest point of this trip and one of the highlights at 5,416 m / 17,700 ft high, the pass is festooned with hundreds of Buddhist prayer flags and with sign board ‘Thorang-la’ and its heights, this place with awesome views of snow capped mountains looking over West at Dhaulagiri, Mustang Himal as well. After a great success, emotional with happy moment descend a long way to reach the bottom with few teahouses to refresh and for lunch before setting towards Muktinath for overnight after a long hard but interesting and adventurous day. The walk to Muktinath is pleasant for few hours, on reaching at Muktinath check into respective nice lodges for overnight stop and nice rest. This place is a holy for both Hindus and Buddhists the word Muktinath literally means ‘the place for Nirvana or Liberation’. After a Big long walk of previous day, today a pleasant trek on the downhill path passing by the village of Jharkot with a drop of 1,200 meters to Kaligandaki river bed, on reaching the wide Kaligandaki River valley at a small place of Ekale bhatti, continue walk on the flat wide valley for few hours reaching at Jomsom, head quarter of Mustang area. Jomsom with an airstrip above Kaligandaki River (operates daily morning schedule flight to and from Pokhara). From Jomsom a nice walk to Marpha, can get very windy in the afternoon on reaching charming Marpha a gem of a village with large apple orchard and its product, Marpha lined with whitewashed houses, paved streets and well kept neat lodges. Pokhara for overnight stop by the pristine Lake Phewa, time in the afternoon to browse around the lake side stores and shops and relax in this beautiful setting.